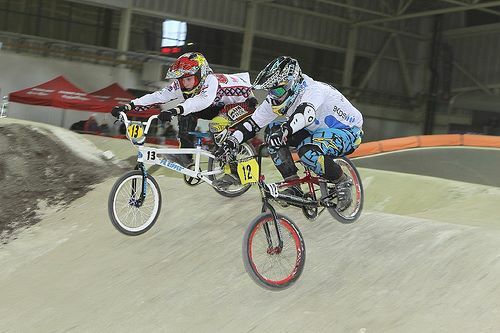 BMX racing is an extremely exciting sport open to riders of all ages, making it great fun for all the family. Up to eight riders race, Moto-Cross-style, around a 300-400m track, with jumps, bump and berms (banked corners). The excitement and popularity of BMX racing have caught the attention of the International Olympic Committee and BMX is now an Olympic sport. Riders come from all areas and backgrounds, starting from four years of age and running up to forty plus. They race against riders of their own age or ability group. Families involved are usually interested in bikes, competitive sport and the physical and mental benefits of being active. It is common for the whole family to be involved with the parents acting as coaches, mechanics, chefs and cheer-leaders. This family angle turns race days into real Events! Equipment, all you need for racing is a helmet (sorry - not one designed for road use or Dirt Jumping! ), a long sleeved shirt, long trousers or jeans and gloves. Rubber soled skateboard or tennis style shoes are recommended and although elbow pads, knee pads and shoulder pads are not essential, they are always a good idea! If you have an open face style helmet, a mouth guard is recommended. A race is contested by up to 8 riders, with the first over the finish line winning. A race meeting usually consists of a series of "Motos" or qualifying races, from which the most successful riders in each category will progress to a series of ride-offs, culminating in a Final to produce an overall winner. At big events, races start in quick succession, with the riders from one Moto hardly completing their race before the next race is charging out of the start gate. This non-stop action and the sheer number of riders make BMX a compelling spectacle and a great day out for riders and spectators alike. It would be impossible to tell you not to be nervous - Pros who have raced for years still get nervous every time they line up on the gate, but that nervous feeling is part of what keeps people coming back to race BMX over and over again. Make sure you are ready at the back of the start hill for your race in plenty of time, around ten races before yours if it is a big meeting. Do not be frightened to ask the other riders what to do - it will be a good way for you to get to know them. The start is the most important part of any race. When the start gate drops, 'snap' (i.e. a quick start) is essential. However, skill is just as important as power and the best riders combine both qualities.